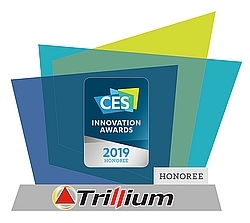 Trillium Secure, Inc. (Trillium), the leader in secure data management, is offering a full-scale experience of the world&apos;s most trusted mobility services platform at CES 2019, which takes place January 8 - 11 at the Las Vegas Convention Center. Trillium Secure, Inc. (Trillium), the leader in secure data management, was named a CES 2019 Innovation Awards Honoree for its trusted mobility platform and services at the CES Unveiled New York event. Trillium Secure, Inc. (Trillium), a leading provider of trusted data management services, opened the doors of its Wireless Center of Excellence in San Diego. Trillium Secure, Inc., the leader in trusted mobility platform services, announced the appointment of Joe Lawrence as Vice President of Sales for the Americas. Trillium Secure, Inc. (Trillium), the leader in vehicle cybersecurity and secure data services, unveiled its new PassGO Hacking Challenge on UCLA&apos;s campus as part of the company&apos;s Hack Across America campaign. Trillium Secure, Inc. (Trillium), the leader in vehicle cybersecurity and secure data lifecycle management, has partnered with the University of Michigan&apos;s TechLab at Mcity program, managed by the Center for Entrepreneurship, to conduct research on how AI can bolster a vehicle&apos;s defenses against cyber-attack. No hacker claimed the bounty offered by Trillium Secure, Inc. (Trillium) at DEF CON 26, which proved the strength of its cybersecurity solution for vehicles and fleets. Trillium Secure, Inc. (Trillium), a leader in secure data lifecycle management and cybersecurity, was selected as Plug and Play&apos;s Hottest Company for the month of August. Trillium Secure, Inc. (Trillium) the global leader in cybersecurity protection and secure data lifecycle management for vehicles and fleets, today puts out a challenge to the world&apos;s top security researchers to hack Trillium SecureGO(TM) in-vehicle network cybersecurity defense. Trillium Secure, Inc. (Trillium), the global leader in cybersecurity protection and secure data management for vehicles and fleets, today announced $11M in Series A2 funding led by JAFCO. Trillium President and CEO David Uze is embarking tomorrow on a six-month road trip to publicize the reality of automotive cyber-attacks, commonly known as car hacking, an intrusion often done remotely using a digital device. Trillium Secure, the global leader in cybersecure automotive platforms, today announced enhanced privacy functionality to its SecureIoT platform that ensures compliance with the European Union&apos;s General Data Privacy Regulation (GDPR). Trillium Secure, Inc., the global leader in transportation cybersecurity, announced today that it is entering the Aerospace and Defense market with the appointment of Washington, D.C.-based Zoran Kehler as the company&apos;s Director of Global Strategy for Aerospace and Defense Programs. Trillium Secure, Inc., the global leader in delivering cyber security as a service (C-SaaS) to the fleet market, announced today that Ross Hirschi has joined Trillium as the Director of Global Engineering. Trillium Secure, Inc., the global leader in delivering cyber security as a service (C-SaaS) to the fleet market, took home top honors at CyberTech Asia 2018. The judges awarded Trillium with the grand prize after learning about SecureIoT, the company&apos;s comprehensive cybersecurity suite and innovative cyber-security as a service business model (C-SaaS). Trillium Secure, Inc., the global leader in transportation cybersecurity technology, known for its disruptive &apos;SecureIoT&apos; Cyber Security-as-a-Service (C-SaaS) platform, today announced that Dan Viza has joined the company as Senior Director of Global Business Development and Strategy. Trillium Secure, Inc., known for its disruptive automotive IoT cybersecurity technology and highly innovative &apos;SecureIoT&apos; Cyber Security as a Service (C-SaaS) platform, has come out on top in a technology startup competition, being crowned &apos;Middleweight Champion&apos; at the &apos;Get in the Ring&apos; event held in Osaka, Japan. Trillium Secure, Inc., known for its disruptive automotive IoT cybersecurity technology and highly innovative Cyber Security as a Service (C-SaaS) platform, &apos;SecureIoT,&apos; has been selected to present at the renowned Munich Summit (MUST) on February 21, 2018. Trillium Secure, Inc. announced the April 2018 deployment of SecureIoT in Tokyo, Japan. This represents the world&apos;s first 24/7/365 connected car Cyber-Security as a Service (C-SaaS) platform. Trillium Secure, Inc., the global leader in automotive cybersecurity technology, today launched its European Operations & Development Center in Brno, Czech Republic. Trillium Secure, Inc. announced that it has been selected by Volkswagen Data:Lab Munich to participate in Startup Collaboration Space. Trillium Secure, a leading provider of automotive cyber security solutions, announced the move of its worldwide headquarters to the United States, and the opening of an Operations Center and new Silicon Valley headquarters in Sunnyvale, California. Trillium Inc, a leading automotive cyber security solutions provider, has received the prestigious Red Herring Top 100 Asia 2017 award acknowledging the potential of its CSAAS (Cyber Security as a Service) business model and advanced SecureIoT cyber security suite. Trillium Announces Acquisition of CanBusHack, Inc. Leading automotive cybersecurity solutions provider Trillium Inc announced today it&apos;s acquisition of the cybersecurity consulting, penetration testing, reverse engineering and training assets of CanBusHack, Inc. The move represents Trillium&apos;s first strategic acquisition as it continues to enhance its product portfolio, consulting and penetration testing capabilities. Trillium Inc, a leading provider of automotive IoT cybersecurity solutions, today announced the launch of SecureSKYE, a data mining and analytics solution for the transportation industry, and enabler for monetization of data-driven innovations and applications for the insurance industry. Tokyo-based Trillium Inc, a leading contender in the global race to close the cyber-security gap that threatens to stop self-driving cars in their tracks, today announced the successful close of its Series A financing round with investments by lead investor Global Brain, with Mizuho Capital and DBJ Capital. Trillium Inc. today announced joint development efforts with NXP Semiconductors (NASDAQ: NXPI) for next-generation automotive cybersecurity applications. The announcement was made at the Munich opening of ESCAR Europe, the leading global conference series on automotive cybersecurity. Global Brain has invested in Trillium Inc, a Japan-based automotive cybersecurity startup, as the Series A lead investor.